Sometimes crossing puzzle genres just fizzles out. Nobody was too into my idea of crossing anagrams with a Rubik's Cube. Moonberry Studios has a much more successful marriage in their new game Picma Squared. 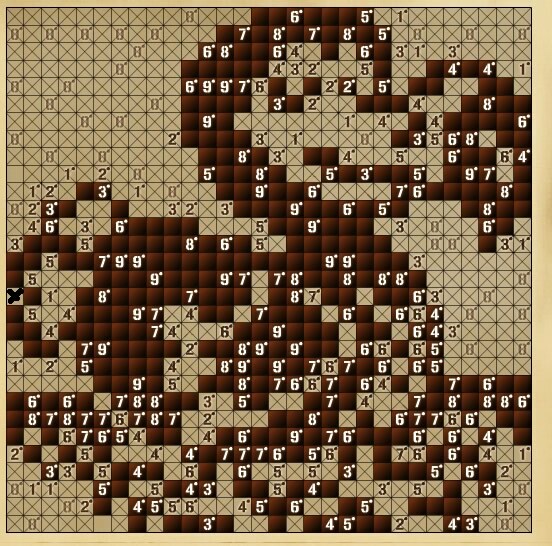 While the previous smash hit Picma was pure picross goodness, the sequel mixes it up with what might be described as a minesweeper element. 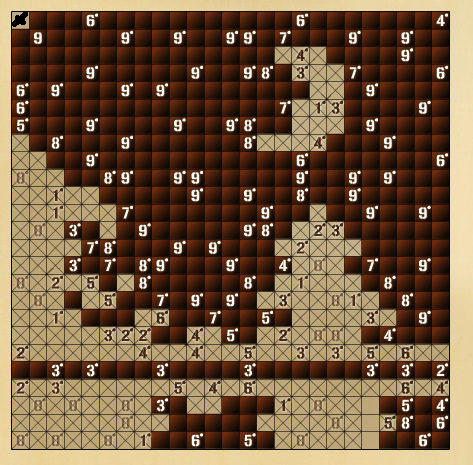 Basically, the game turns minesweeper-ish gameplay to picross-style pixel image drawing purpose. 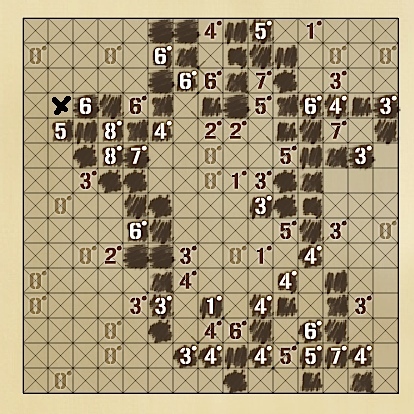 Instead of clues being along the edges of the game field like in picross, you'll see numbers from 0 to 9 scattered across the field itself. A 0 means that neither the clue square nor the up to 8 surrounding squares is colored with a given color; a 9 means that the clue square and 8 squares around it are all colored the given color. 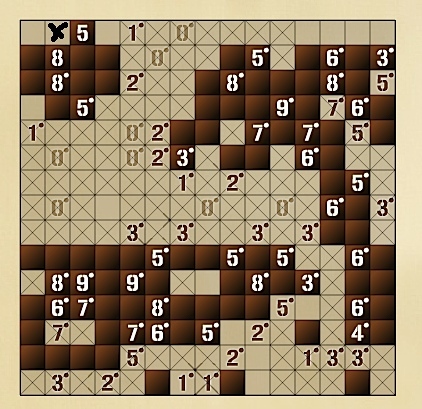 Puzzlers must use logic to solve these clues, clicking with the mouse to mark squares that should be colored. At the bottom left, you can click to change from coloring to marking blanks, or blanks can be marked by holding [shift] while clicking. 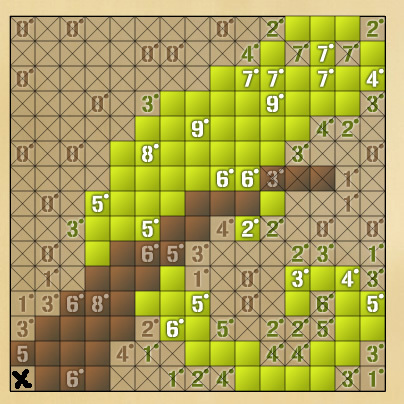 Multiple squares can be dragged over at once with either method. On the right, you can click the green button or hold [ctrl] to drag the game window around, and use the + and - buttons to make the playing field larger and smaller. Clicking outside the window or the [P] button pauses, and in the options menu you can toggle sound and music, and switch between two visual styles for the game window. There are certain tricks which the game teaches you in the tutorial level, such as a four in the corner or a six along an edge, but the real challenge and fun of the game is after you've bubbled in all these obvious clues and you start looking for interactions that you've missed. 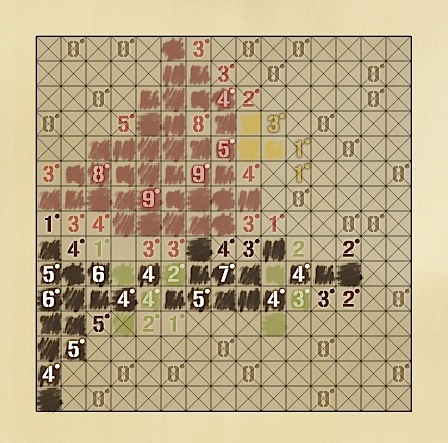 Just like in picross, marking squares blank isn't technically necessary to win, but it's practically indispensable to solving it, especially in mulitcolored levels. 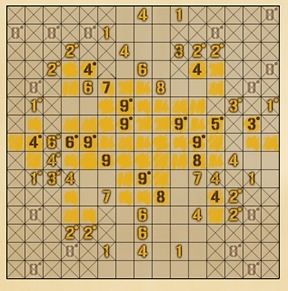 In these levels with two or more colors, the key to solving it is to remember that a clue square can only either be its own color or blank, never any of the other colors. Analysis: While 48 levels is a solid chunk to play, you might wish the available level sizes were a bit larger. Even a level or two each of 20x20, 25x25 and 30x30 levels would have made the game feel more complete, as the hardest free levels available can all easily be completed in less than twenty minutes, some in as little as five minutes. 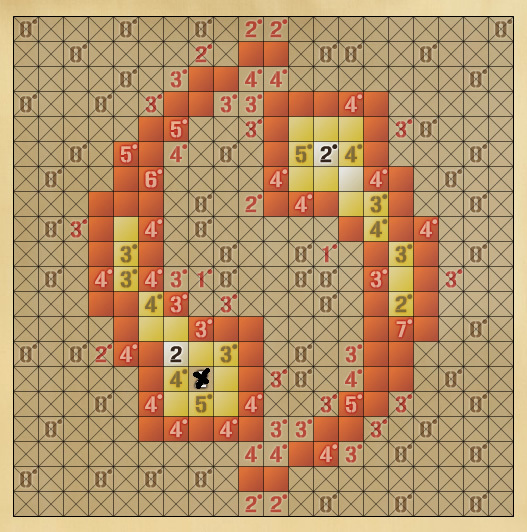 In this respect, at least, Picma Squared does offer the perfect chunk of casual logic puzzle gaming; something that newcomers can cut their teeth on, and veterans can pick up and enjoy a nice cerebral workout for a while. When you finish a puzzle, aside from the satisfaction of a brain well-exercised, you're rewarded with a pixel-ish art drawing of a palm tree or a dragon. 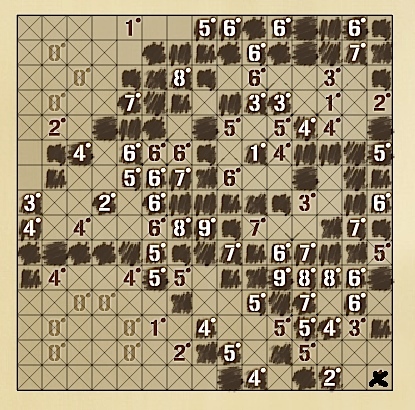 While you can sometimes tell vaguely what a picture is going to depict as you're solving it, it's rarely worthwhile to actually try to fill in the puzzle squares based on what you think should be filled. A single square here or there can totally mess up everything, and when you try to go back to fix it, you have no way to distinguish what was a guess. Best to stick to cold, hard logic here. You will never have to guess. There will always be something you can deduce. You just have to look harder for it. If you do find yourself burning through the available levels, you might be glad to know that the developer's site offers access to more for a small fee. The subscription method is a little awkward. You have to register to even see what the subscription costs are. However, Picma Squared does provide a win/win solution for those desperate to play more but unwilling or unable to pay out the money to do so. Create a level in the level editor and submit it. If it's approved, you receive two credits which enable you to buy two individual levels, and your level will be available to be played by others. The game makers are aiming for a 48hr or less turnaround for approving levels. Picma Squared Walkthrough now available! The game was revised recently, and what follows is our updated walkthrough for the new version. Read the "tips" section in the game itself first, and do the tutorial, that covers all the basics. Always use [shift] to block out squares that can't be filled. 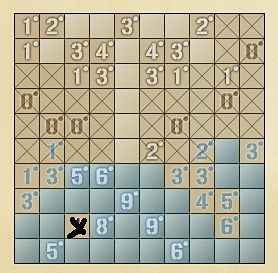 This is probably the single most important part of solving puzzles. 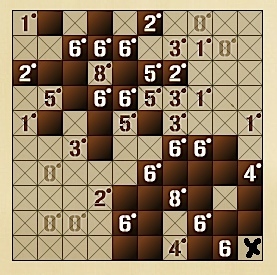 When you look at a number clue, focus only on the immediately surrounding blocks. 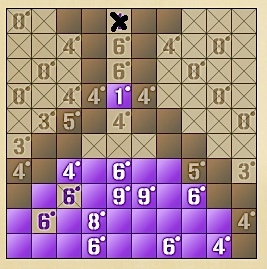 Remember that as soon as you block out one square next to an 8, two squares next to a seven, etc, that all the remaining squares in that block will be filled. Don't think about the big picture, focus on the small aspects. If you get stuck in one area, go to a totally different part of the grid. You should never have to guess. If you truly feel like there is nothing you can deduce, either you are missing something, or you have made a mistake. You might want to start the puzzle over. I personally find that in multicolored puzzles, I find the "simple" visual style easier to keep track of than the "sketch" visual style. You can switch between visual styles in the options menu, so see which style works better for your brain. joye also put together a walkthrough for those who are playing the Kongregate version of the game. 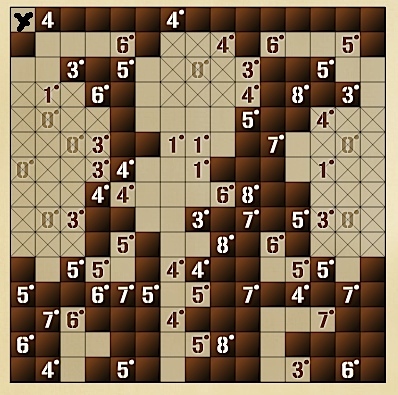 This type of puzzle isn't new--Conceptis has had these puzzles for years (under the name "Fill-A-Pix"). 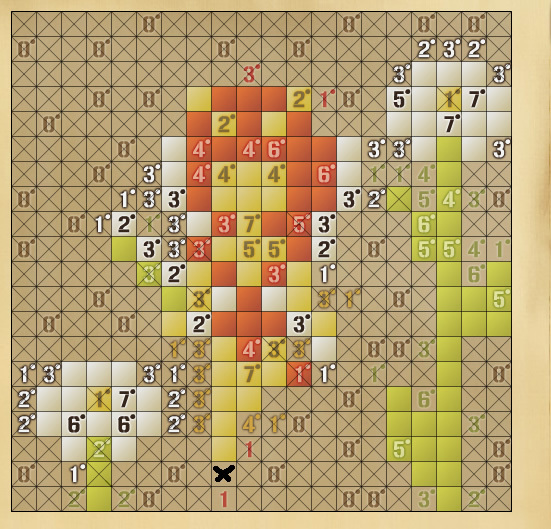 However, the multicolored puzzles are a great addition, and the interface is definitely snazzy and easy to use. 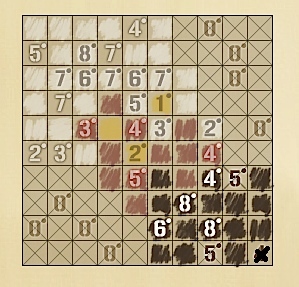 I ran into a puzzle in the last group where there wasn't a unique solution. That was kind of annoying. Overall it was fun though and I really liked the last puzzle. @Brian - No puzzle has more than one logical solution. You may however be equating marked hints with correct ones. Remember that for all intents and purposes when filling cells with a particular colour, any cells containing a clue of another colour can be considered empty. 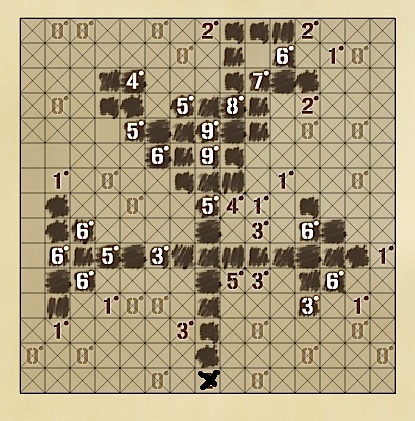 You should also keep in mind the following (from the "Tips" page found in-game): "A small dot appears next to any clues with the correct number of filled squares around them. 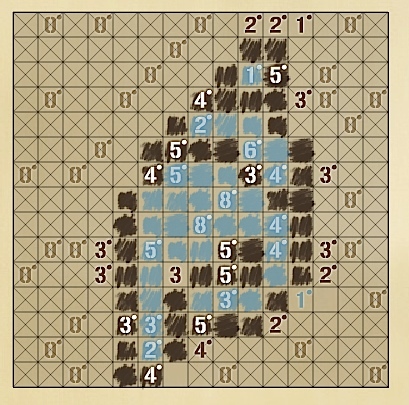 The position of these squares may however be incorrect." 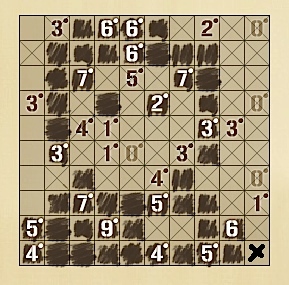 Actually, even in the Expert set of puzzles, there was a puzzle which had non-unique solutions. 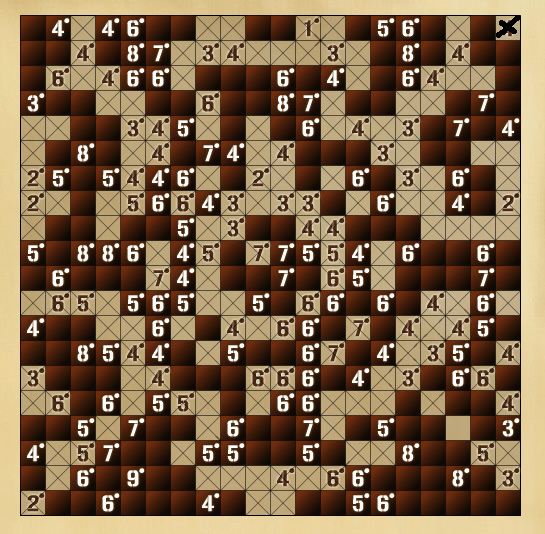 All the constraints were satisfied, but the puzzle was still "wrong" somehow. 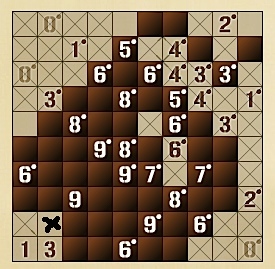 This was the ninth puzzle, if curious. 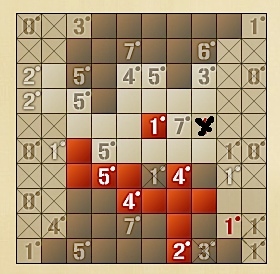 Could you please send us a screenshot of your non-working solution to the puzzle to [email protected]? We would like to clear this up. 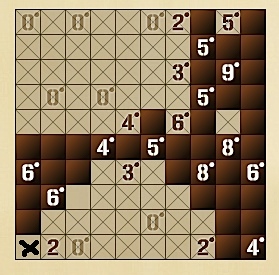 @Konrad - Your first "solution" breaks one of the two rules of the game: "A cell that contains a clue is either empty or filled with that same colour." I would also like to point out once more that the dots that appear near a clue do NOT mean you got it right, they only mean you got the correct number of filled cells around the clue, nothing else. If a puzzle you "completed" doesn't end you can safely assume you made a mistake. Ahhhhhhhhh... The empty/same color rule fixes the alternate solutions. Also makes the puzzles a little easier on the brain. 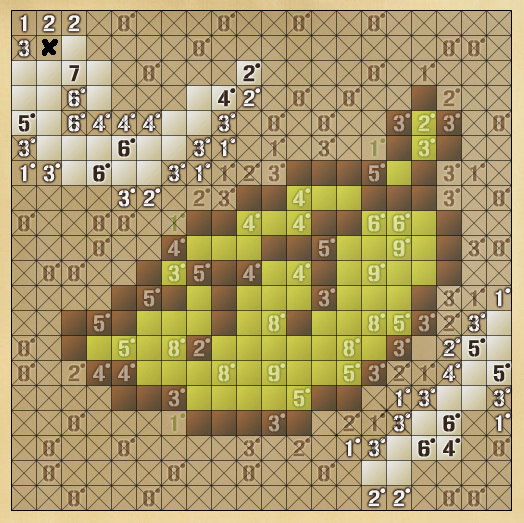 Woah, it is just like Fill-A-Pix. I never thought you could do a colored version though. Interesting addition. Weird bug: In Firefox 4.0, when I press the Shift key, the grid slides left. This gives me a limited number of Shift-clicks before the grid slides off the screen. Huzzah! finished the 50x50 puzzle at the end! It took 45 minutes but I did it. Now what am I going to do with my life? 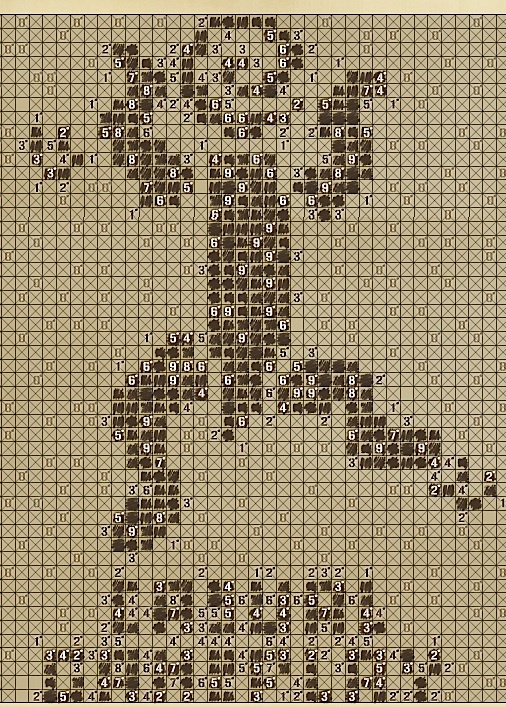 Fill-a-Pix was always my favorite on Conceptis (and I started playing way back when you had to print out the puzzles to do them. I still find them sometimes tucked in with my college stuff). I love the use of color with these. I think it definitely adds something to the game. I'm hoping there are going to be more puzzles (other Picma had some added at some point, right? ), since I've finished them all already. One minor thing I felt about doing these puzzles though was that they didn't get particularly harder with each grouping, they just got bigger. 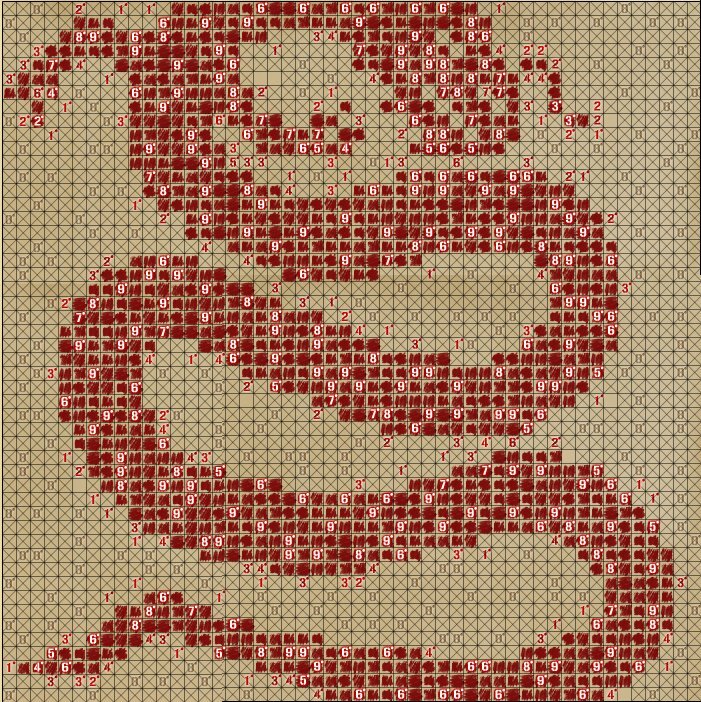 And even then sometimes a lot of the squares were already X-ed out (the last level for example didn't really feel like a 50x50 puzzle to me, as lovely as the final image is ;)). 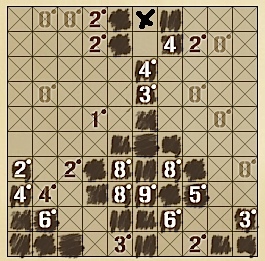 But I also get annoyed with these puzzles when there's too much guessing involved and you have to keep backing up to undo work and coming up with new possible combinations. 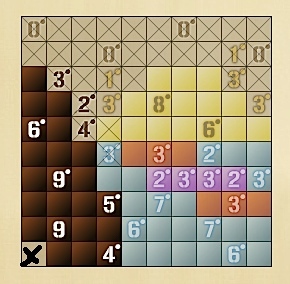 I realize it's a fine line between too easy and too frustrating with these sorts of puzzles, but I wanted to mention it in case there is a new batch coming at some point. 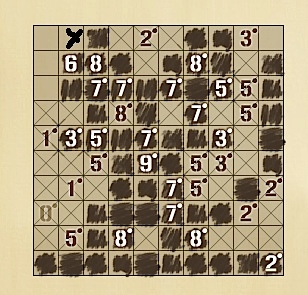 The puzzles available really are good, and I enjoyed them. Is there any easy way to cycle through colors on the palette? If so, what is it, you should mention it in the intro. If not, please add one! Otherwise, I'm loving this. 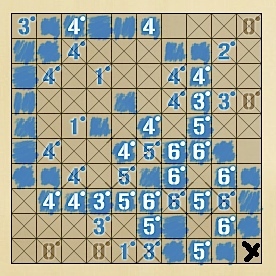 I play these every week on Conceptis, and even have their book of the puzzles so I can solve them not at my computer. I could also use a "Reset" button for if I mess up and want to restart the level without having to exit to the selection menu. @Dan & tigrita- We have over 1500 Picma Squared puzzles at our website (and over 4000 Picma/Picross ones). Those should keep you occupied for a while. You will find the link in the review. Regarding the difficulty, I totally understand your point. 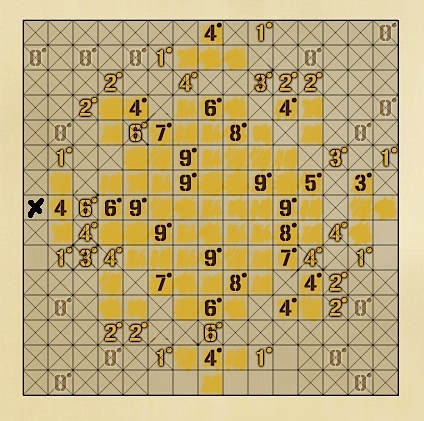 Sadly it is near-impossible to predict a puzzle's difficulty computationally. 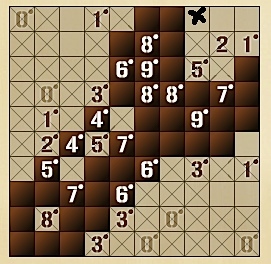 However we will soon use the average comletion time as a guide to a puzzle's difficulty. @Ezra - That is indeed weird. We tested the game on many different browsers but that wasn't one of them. We'll look into it. @chibidani - You can cycle trough the available colours using the "Z" key and select them directly using the "1-7" number keys. We have this information on our webpage but seems we forgot to add it to the in-game help. We'll fix that! 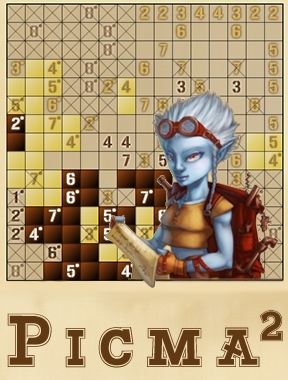 Thank you all for your comments and for playing Picma Squared! Are there more? More? I just need one more. MOAR! I was wondering when this was going to be posted. Just a suggestion, then - if one of the explicit rules states you cannot fill a numbered spot with the wrong colour, wouldn't it be logical just to disallow the player from doing so? 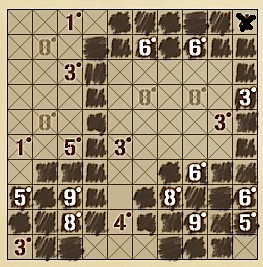 I was playing this and got quite frustrated, similarly to what has been stated above, and quit, as I seemed to have fulfilled all of the requirements yet the level was not progressing. I imagine many people would simply launch straight in, as I did, and would come at fault here, due to not knowing this rule. Even if it is one's own fault for not reading the rules, it should perhaps be more obvious, was all I thought. Funny thing - I just finished with the Android demo of Prisma Squared last night, so I went internet browsing for the developer site, and instead got the JIG recommend for the browser version. Serendipity! Especially since I can play flash games on the 'droid \o/. I've been playing colored fill-a-pix for a while now, the program called PrismaPix. The main difference is, they separate the different colors into layers, not all on the same board at once like P2. Once I went to the training levels and hunted down the multi-color ones to learn how this particular program handled them, I was gold. Small puzzles, so not what I consider 'difficult', but they are fantastic bites of logic fun; I anticipate spending actual money on the 'droid version, especially if there is continued puzzle development. @Setia - We crafted the interface so that accidental errors such as replacing/erasing a previously filled cell while working on a different colour wouldn't be possible. Nevertheless at some point you must stop holding the player's hand and having the interface avoid non-accidental mistakes is a line we do not want to cross. 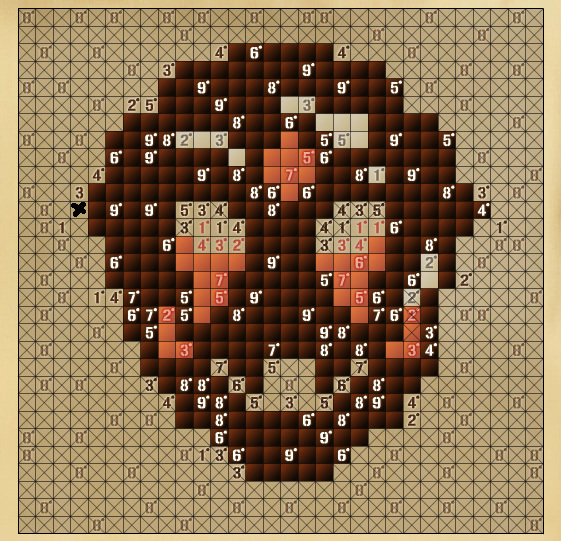 OtherBill, Conceptis did have full color versions of Fill-A-Pix. 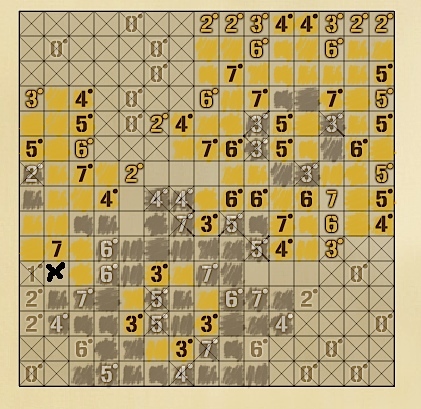 They were my absolute favorite puzzles on the web. I miss their free content so much!! So I will gladly try these out to see if they come close, although I agree that the small size is disappointing. I remember some Fill-A-Pix puzzles that were too big to fit in the window, even at the most zoomed out option on Conceptis. Huger is better in these games! 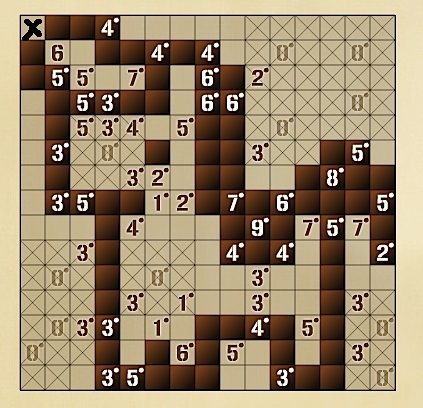 @Jesslin - The difference between the free and pay versions of Picma Squared for the Android is simply the number of available puzzles. Both games are however "finished" and will receive no further updates (other than eventual bug fixes). When we have the chance we will instead develop a new App that connects to our current site database, allowing subscribers to play Picma and Picma Squared using either a "desktop" computer or a mobile device. This is still a long way from fruition, so please don't hold out for it. My personal advice would be to get a subscription at our website (linked on the review) instead of the pay version of the current Android App. 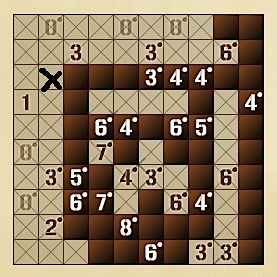 While it's not really playable on a mobile it will give you access to several hundred puzzles. @Moonberry: Thanks for the tip! @William McDuff - On the 8th column, the one with 3 clues of 5, the one in the middle isn't marked as "completed". You made a mistake while solving the puzzle. @MoonberryStudios Aha! Thanks. Just couldn't see where I was missing. I'd appreciate a "highlight errors" function (e.g., show me the numbers that aren't satisfied). There are a couple times when I missed one number and spent a good amount of time hunting for it. But maybe that's part of the fun. This is excellent. 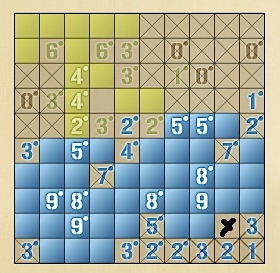 This is the puzzle I always wanted minesweeper to be! All the logic, with the seriously annoying luck factor removed. 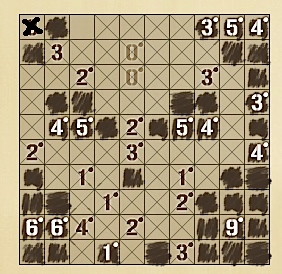 Now that I've solved every puzzle, I'm back with more comments. I agree with whoever said the X's were too hard to see. I feel like I have to squint or make the puzzle bigger to be able to distinguish them properly. Also, I wanted more color puzzles! I was already familiar with Conceptis' Fill-A-Pix, but I've never seen versions with color, so I was a little disappointed most of these were one color. I also agree with Jesslin. I couldn't figure out how the hint feature worked, and it isn't explained anywhere. I increased the size of the game window from 640x480 to 800x600 in hopes of addressing the complaint about the small size of the game. While the resolution of some of the bitmaps suffers somewhat, overall I think it's quite playable in the larger size. 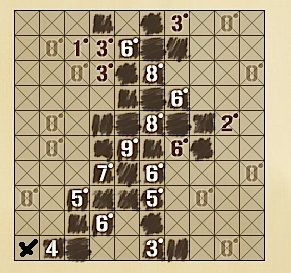 Interesting puzzles, but I keep running into a bug where the "pen" doesn't stop drawing after a puzzle is solved, and it scribbles onto the next puzzle, rendering it unsolvable. I totally agree with all the comments expressing frustration with the marked 'hint' square = only one color possible rule. A simple way to teach this rule easily without affecting the game play would be to build a tutorial level that addresses only this problem. For example, design a nine square cube, put a yellow 8 in the center and a black 1 in one corner. OK, I do have one tiny complain. About the puzzle creation editor. 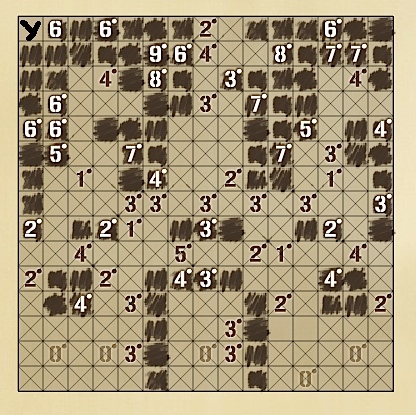 When a puzzle is completed, I continue to hear the scribble sounds in the background as the puzzle completion sequence occurs. 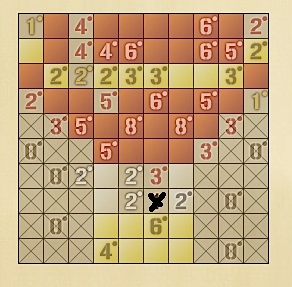 At this point, if I click anywhere on the screen other than the Finish button, the sounds for the puzzle completed sequence will play again, and the Finish button will disappear, leaving me stuck at this point and having to reload to play again. If I click the finish button, the scribble sounds will continue, but I'll be able to start another puzzle. 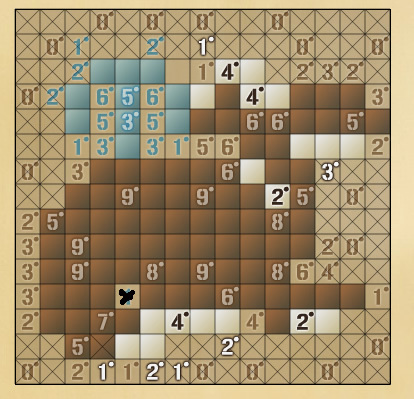 if the mouse runs over the puzzle while in this state, it will draw on it in whatever color was the last to be used (even if that's not a valid color for the puzzle) and again leave it in an unplayable state. 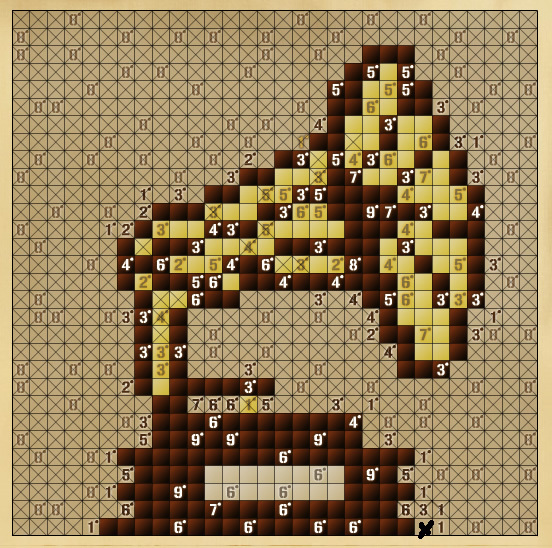 if I click outside of the puzzle it will stop the scribble sounds and I can play the puzzle, but when the puzzle is completed it will get into the same state as mentioned above with no finish button. @Brian Lutz - That's a new one. We have had no other reports (yet) of such an issue and we were unable to reproduce it. Could you please let us know what kind of browser and OS you use, as well as the versions of the browser and Flash plugin? @Various - We are currently working on an update to the game that will fix a couple of minor bugs and improve a few aspects of the game. We should have it ready in a few hours. Also, it's worth the note that once you earn credits, they don't "unlock" puzzles... they give you the right to play it... once. 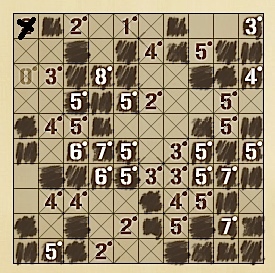 The game should a) tell you which puzzles are locked vs. unlocked, b) remember where you spent your credits, and c) confirm before spending credits. @basseq - You should really double-check before reporting blatantly false information. Yes, credits do unlock puzzles and they always have. Once you play a puzzle it will always be available for you to replay, even when you have no credits or your subscription has expired. 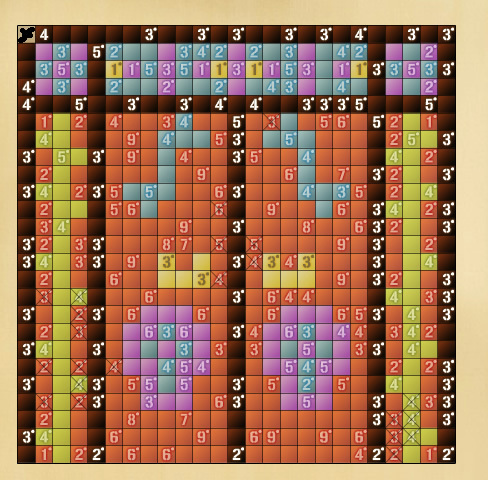 You will find all of your previously solved puzzles in the aptly named tab of "Solved". The game "remembers" where you spent the credits in the same tab, showing you a collection of all the puzzles you have ever solved. 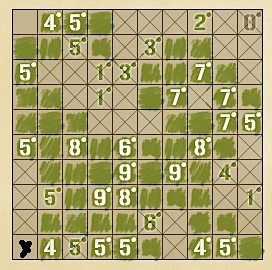 Every puzzle other than those in the Free sets (which are marked by a green background), requires credits or a subscription. A "confirmation" would therefore be quite pointless and annoying. 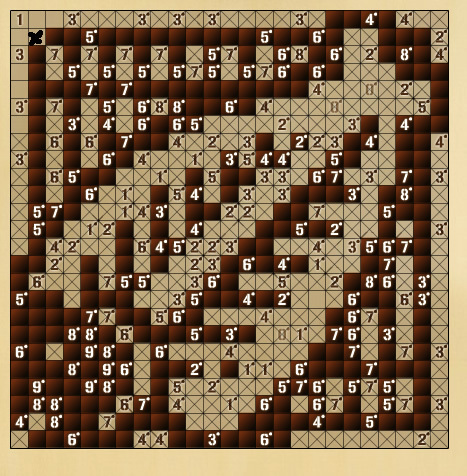 I have to note that, there isn't 48 puzzles...there are 60? @DannyBoy - Yes and no. There are 48 free puzzles for Picma Squared and 60 for the "original" Picma (as well as a free daily puzzle). At the beginning of every multicolored puzzle, cycle through each color and X out all the squares with clues for other colors. 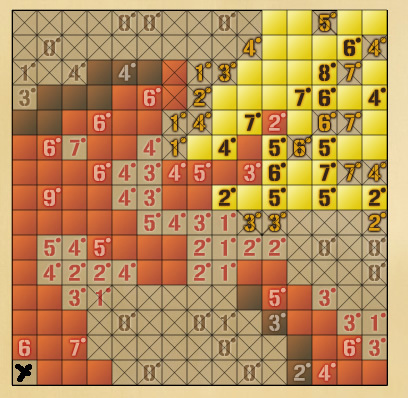 So for example, pick brown, then put X's on every square with a white, blue, or yellow hint. Do the same for all other colors. Speeds up solving immensely! Or.. you don't do it since you already know it can't be that color. Speeds up solving even more! Just finished the last one, the 50x50. Pretty good experience. As far as I've seen, no guessing or alternate ending whatsoever. The inability to break the "second rule" of the game. 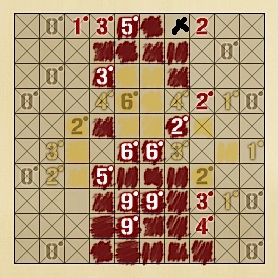 Anyone who has "finished" the old version will now find more than a dozen new puzzles to play (replacing the old ones). It doesn't load for me anymore. I just see a white box. Is there a walkthrough for the updated version? I see a couple puzzles that aren't up here. The hints don't do anything for me. I play this on Kongregate. Most of these walkthroughs have unrecognizable puzzles for me? Does anyone else have an issue with using the hint button? 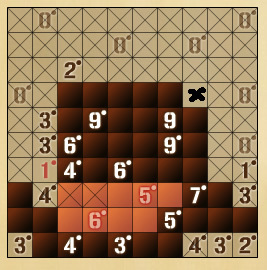 Click hint then click the square you want it to solve for. Still missing 1 puzzle. Probably one of those 2 that arent working. I have the solution to journeyman 12 if you need. It seems we dont have one here. I've saved the screencap if you wanna email me and let me send it. Whoever runs this thing. Seems like the solution to journeyman 12 isn't correct. 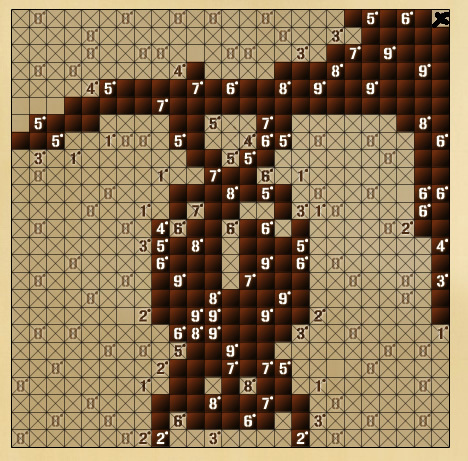 Maybe there are at least a couple of different puzzles for that level as well? would also like a solution for the last one on kong. the only one i have left. OMG! look below the 7 on expert level 4! 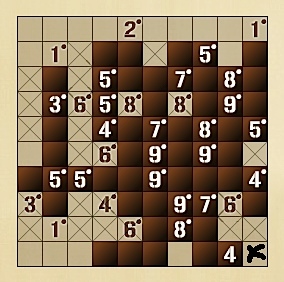 I've found a solution for Expert 4 that satisfies all the clues yet doesnt get counted as complete. How do I submit a screencap I took? 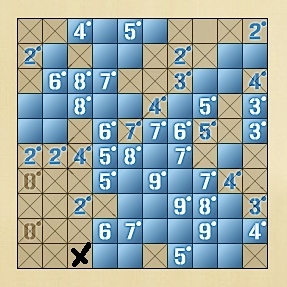 So where's the pic for last master puzzle on Kongregate? 50x50. Can't find it in the walktrough.